Wait, wait, wait. How did this get here? Seriously, don't trust her. So, yes. This is my page. It's, um, very nice. A little bit sparse, but y'know, working on it. Why don't you go ahead and read it? I mean, it's no Machiavelli- which I've read, by the way- but it's very interesting. You'll notice it's a great deal more readable than her page, as I'm not changing the capitalization or the little teensy writing style every third letter or so. Nope, not good Ol' Wheatley — consistency is my middle name...though, actually, I don't have a last name, so I can't really have a middle name either, so... yeah. Anyway, you get to just sit back, read in comfort, and imagine that I'm talking to you in the kind of smooth, chipper Bristolian accent you might associate with very tall, very blonde, very... um... bespectacled British comedians. Or a very talented YouTuber. Also, on an unrelated note, anyone kind enough to conduct some kind of space rescue mission for me or if someone happens to pass by near the moon, here are my coordinates . Oh, also, if you see a tiny plastic block figure that looks like me, ask him how he got out of space. Wait, what? Why are those words invisible? Hold on, just wait a bit I can fix it... wait a bit... I can... ... Err... while we're waiting, why don't you feel free to highlight that line? Trust me, there's no spoiler in that spoiler tag. Especially big endgame spoilers about myself. Hey, there it is again! Wonder why that is? note GLaDOS: THEY're spoilers YOU idiot. Hey! Who let her in here?! What's a trope? Is this a trope? ...These are tropes, aren't they. Ooh. My bad, my bad. Blame me. Blame the innocent little core. Just like humans. Adorkable: I'm handsome! I'm dashing, really. Not a dork. Not a moron. Handsome. Not awkward, not dorky. Just...just dashing. A.I. Is a Crapshoot: Oh, way to keep it classy. The Alcoholic: I just - I just had to test. All Girls Like Ponies: And boybands... right? As Long as It Sounds Foreign: Because a foreign accent is beyond her range of hearing. The Atoner: Hopefully you don't have any hard feelings about the whole "trying to bump you off" thing. Which, to be fair, seems to be a pretty common occurrence around here. Berserk Button: I! AM NOT! A! MORON!!!!! ...sorry. That's just a bit of a, you know, a sensitive subject. But I'm working on it. Bishounen: You wouldn't think it to look at me, would you? But I can be, um, quite charming when I want to be. *seductive upper railing waggle* I'm especially dashing in the fanart. Booby Trap: I know how to get around them and how to make them. Boss Battle: Oooh, that sounds very impressive, doesn't it? Final Boss: Oooh, even better! More definitive and climactic sounding! Blatant Lies: They told me if I ever detached from the rail or turned on my flashlight I would die! Can you believe that? Honestly, I don't know why they gave me these things if they didn't want me to use them. Brainwashed and Crazy: Yeah, you try being stuck in HER body, and see how well you hold up. British Accent: Yeah, I've got one. Makes me sound pretty distinguished, doesn't it? More specifically, it's a Bristolian accent, so, you know. Distinguished. Can you believe they were going to give me a Northern accent? Glad that worked out otherwise. Buffy Speak: You versus me, Holmes versus Moriarty, Aristotle versus MASHY SPIKE PLATE! The Cameo: I may just happen to appear floating around the skills screen in an official Game Mod for The Elder Scrolls V: Skyrim. I was also in that little plastic game thing, where I worked with, oh, nobody special, just Batman. And...that bearded guy. And the lady with the jacket. There were...there were a lot of important people there. You know, not bragging or anything. There's also a small easter egg involving me in a game called...um...uh...Determined Danny? Is that right? Or at least, I think the people who made that game made the one I'm in. Continue Your Mission, Dammit! : I spy something that starts with the letter F. It's the floor, which is where you left me. Please pick me up. I spy something else that starts with the letter A. Also the floor. Pick me up. Remember when you picked me up five seconds ago? That was amazing, do it again. Evil Is Petty: I wasn't that bad, was I? Faceless Eye: Oooh, I have one of those! Well, technically my whole body is one. Guess I don't have much of a body outside of that, do I? Fantastic Arousal: I reaaaally like it when you complete the tests. Fantastic Racism: Don't get me started on smelly humans ... Oh, wait. That came out wrong. Feigning Intelligence: Not feigning! But geinfing! See what I did there? I just invented a brand new word... using nothing but the power of my mind. Gratuitous Spanish: ¿Dónde estas, dónde estás, Yolanda? See what I did there? I just politely asked to take a little midday nap. ...Okay, I might not know what I'm saying in Spanish, but I can always look it up. Gravity Master: Not the real me, but I hear there's a tiny plastic version of me somewhere that has mastered anti-gravity. HeelFace Door-Slam: You might not have heard (and that's understandable; I was only unplugged a few seconds before getting thrown into space), but I actually was sorry about the things I did. Height Angst: A whole sector full of nanobots, and who's the one fellow they pick on? That's right, the oversized ID core. I'll have you know I am quite a normal size compared to the other Cores! Thanks for the hate crime, Jerry! I'll see you in court, mate. Idiot Ball: That's... that's brilliant, that is. Low. Thanks for the hate crime, mate. Image Song: "Wheatley's Song ." A bit of a collaboration between me and Miracle of Sound. I did most of the work, though, you know, what with me being a genius and all. So don't call me a moron, you fostered balloon. My IQ's the infinite space from here to the moon. Hm... catchy. Informed Flaw: The idiot thing. I'm really very clever. Innocent Blue Eyes: Well, innocent blue eye anyway. Much more trustworthy than her Yellow Eye of Sneakiness, if you ask me. Honestly, who would trust a person with a yellow eye? You'd have to be pretty desperate, dropped down into a deep mine shaft or something...you know...just as a hypothetical example. It's All About Me: I did this. Tiny little Wheatley made this entire page. And single-handedly defeated her while you sat around. Logic Bomb: What, that stupid "This question is false" thing? Pfft. Easy. It's "true", obviously. Motor Mouth: Well... technically, a motor mouth would have to be a mouth that is powered by a motor, and seeing that... wait... Oh, right, I'm all motors, aren't I? BUT... But I don't have a mouth. No mouth. Just an eye. A big blue eye... with eyelids... that move whenever I talk... like a mouth. You know what? I'm just gonna go on record saying that I'm NOT a motor mouth.. because... ugh.. yeah, I got nothing. Mr. Fanservice: It's the voice, isn't it? Yeah, the ladies love the voice. Not that the rest of me isn't, you know, attractive. Know-Nothing Know-It-All: Hey! I know plenty of stuff! I am not a moron. Non-Human Sidekick: Sidekick? Hardly! Especially not to a human...er, not that there's anything wrong with that. Not That There's Anything Wrong with That: Really, some of my best friends are adopted. And human. Human and adopted. Percussive Maintenance: It's called "hacking." An' I can't do it while you're watching. I really can't. Psycho Serum: I don't know why I did those horrible things. As soon as I was plugged in I went mad. Punctuated! For! Emphasis! : I! AM NOT! A! MORON! ...oh, sorry, I did it again. The Cake Is a Lie: I- I don't even know what this means. Why is it here? Too Dumb to Fool: More like too SMART to...fool! Yes! In fact you know what I'm actually paradox-proof, actually. Unexplained Recovery: Oh, you mean after she crushed me like a grape? Well, it's really very sim— Ahhh! Life flashing in front of optic again! Sorry, that... that keeps happening every time I try to discuss it. Let's just move on, shall we? Also, I gotta say, I really love those new, blue portally things. No idea where they come from, though. What A Moron: Alright, once more. Ahem. I! AM NOT! A! MORON! Yank the Dog's Chain: It wasn't very kind of Valve to tell me I'm getting a award launched at me! Only to get actually hit in the face with said award. Not kind at all! ...I thought I was going home. 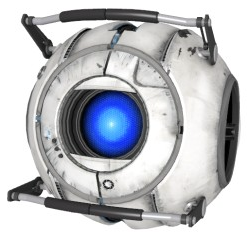 Wheatley: Where do you think you are going? Come back! Announcer: Stalemate Resolution Associate: Please press the Back button or any of the provided links in this page. GLaDOS: Go press the button! Go press it! GLaDOS: We're so close! Go press the button! Wheatley: Do not. Press. That. Button. Wheatley: Don't press the button!